Many who have come out of religious families and cultures formally announced their rejection of superstition by writing letters/emails to their families and friends. The letters weren't necessary written because these apostates were unwilling to say the words in person, but quite often they provide a comprehensive, detailed, measured and permenant record of such an important decision. 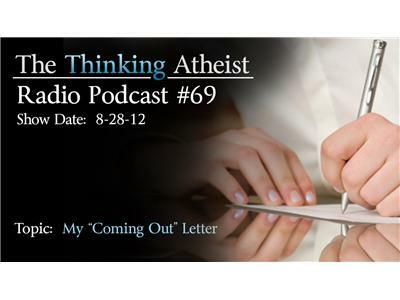 In this episode, our listeners are welcome to share the "Coming Out as an Atheist" letters with us (ommitting any elements too personal, of course). Callers may read their letters, or send them in email form (with any elaboration and backstory needed) to editor@thethinkingatheist.com. For time, longer letters may be abridged for broadcast, but we'll take every care to maintain the integrity of the piece.